We are proud to introduce the newest shapes in the BriarWorks Classic line: the C141 Cutty and C142 Belge. Both shapes come in short and long versions and will be available on our web store tomorrow and at the West Coast Pipe Show, November 4-5, 2017. Pete will be at Ford on Fifth in Scottsdale, AZ on Thursday, November 2nd. 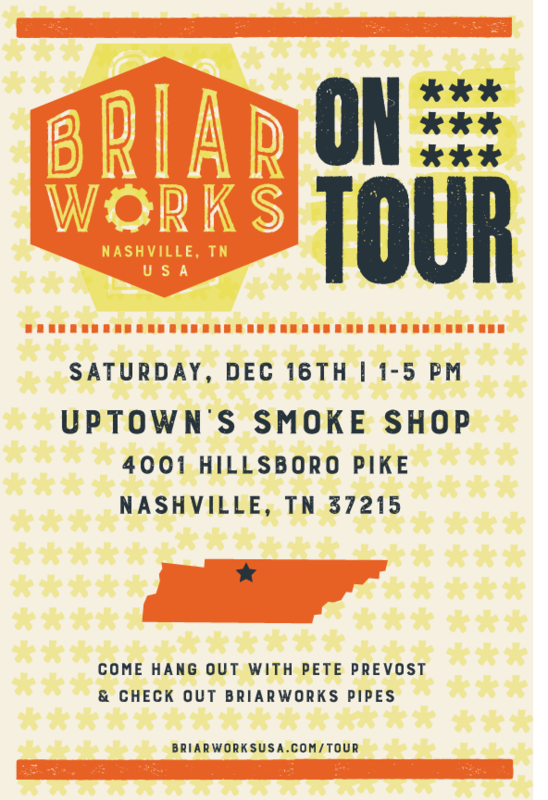 If you are in the area stop in for a visit and check out the BriarWorks pipes that Pete will have with him. A Nashville treasure, Hatch Show Print began as a small family owned print shop in 1879. Hatch Show became the go to print shop for events and concerts in Nashville, and as country music began to grow in popularity so did the demand for their unique take on design and printing. The bold color and typography employed by Hatch Show in their letterpress work quickly became a cornerstone of the country music aesthetic. As computers and software took over as the primary tools in the design world, Hatch Show continued to create beautiful letterpress posters the way they always have, and their work is as popular as ever. There are some things that can't be replicated on a computer. Hatch Show designer/printers select type and imagery from their large antique collection and arrange the designs by hand, ink them by hand, and run the presses by hand - one color at a time, one sheet at a time. Many of the folks at BriarWorks have been fans of Hatch Show for a long time and after some planning and a lot of excitement we had the opportunity to work with them to create a BriarWorks poster. We think it really captures the spirit of both BriarWorks and Hatch Show Print. Pete and I had a chance to watch the final stages of printing and were treated to a tour of the shop. Thanks to Amber and the rest of the crew at Hatch Show for the great work and inviting us over to see the process. Here are some in progress photos, a video, and the finished poster. I went to Crema the first week they opened about ten years ago. Saying that around Nashville sounds like some sort of hipster Christopher Columbus brag since they are pretty much the best coffee shop in the city, but I promise I’m not trying to stake any claim here. I was driving through the newly transitioning Rolling Mill Hill area of downtown and saw the Crema sign. I stopped to check it out. I ordered my coffee and talked a bit with the barista, Rachel, who happens to be the owner along with her husband Ben. Instantly it became my new favorite place. They are great people, and over the last decade have honed in their craft, and have grown to be a very successful local business. We are very proud to be a local business here, and we want to tell all of our friends about other things that we love in our city. Coffee seemed like a good place to start. We drink a lot of coffee at BriarWorks. There are lots of pipes to be made, and the caffeine definitely helps. Mostly, we just really like good coffee! Crema has kindly allowed us to run a promotion with their wonderful product. 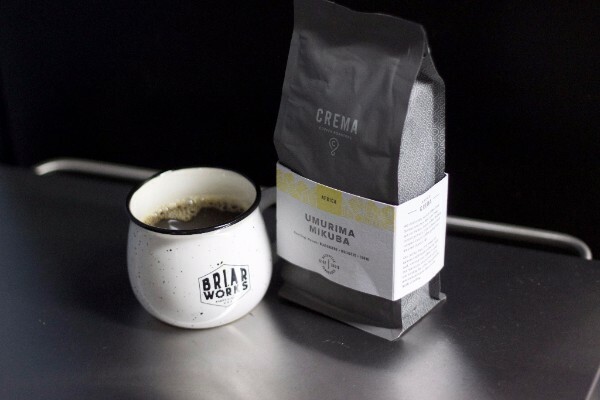 We have chosen for you, a single origin from the Umurima Mikuba farm in the country of Burundi. This coffee is very good. For the next week or until it's all gone, if you spend $100 or more on your order in our online store, you will receive a really sweet BriarWorks campfire mug and a 12-ounce bag of this coffee for free! We are getting a limited amount of this coffee so it will be restricted to one bag and mug per order. In order to give you maximum freshness, this coffee is not even going to be roasted until Monday. Orders will start shipping out on Tuesday morning. In our opinion, a great cup of coffee and a pipe are what dreams are made of. Act quickly, and don’t miss out on this special deal. We're proud to finally introduce our newest line of pipes, BriarWorks Original. This project has been in the works for a while and we are really excited to finally release them. The BriarWorks team includes five hand made pipe makers and each one of them contributed a shape design for the initial release. Two of the shapes, the Stubby Apple and Bent Strawberry were two of our favorite shapes from the Icarus and Neptune lines and we're happy to have them back in production with some new finishes and stem options. Check out the Brands page for more details on each shape. We hope that all of you are as excited about these new shapes as we are. In celebration of this new release we're doing a pretty excellent promotion/giveaway. Any BriarWorks Original pipe purchase, from the BriarWorks online store, from now until August 16th will get you entered in to win a five pipe set which includes one each of the Original shapes. We've never done a giveaway promotion like this before, but we feel like these are special pipes that deserve a special release. To all of you that have been loyal customers over the years, thank you. We feel confident that BriarWorks Original are some of our best pipes yet, and we look forward to sharing them with you. Each pipe purchase is one entry into the contest. Multiple pipes earn multiple entries. The drawing will take place on August 17th. We have a lot of love and appreciation for our customers. That's why we decided to run several special deals all summer long. We didn't want to ease into these summer deals though. We want to start this off big by offering all BriarWorks Signature pipes at a ridiculously good price for one week. Get $125 off any Signature sandblast! Get $150 off any Signature smooth!! Do not miss this opportunity to own one of our nicest pipes at an insane price. Stay tuned for many other great deals coming up throughout summer! Pete is back out on the road for an event at Anstead's Tobacco Company in Fayetteville, NC on June 2, 2017. Anstead's is also hosting a Gurkha event on June 2nd, so if you are in the Fayetteville area and are looking for quality pipes or cigars, Anstead's is the place to be. In celebration of the industry and hobby we all love, February 20th, 2017 is International Pipe Smoking Day. As a way to say thank you to our customers and pipe smokers everywhere, we're running a 20% off sale on all items on the BriarWorks shop through Friday, February 24th. Instead of celebrating for just a day, we decided to celebrate IPSD all week! Items are already discounted on the site, so no coupon codes are necessary. BriarWorks' Pete Prevost is hitting the road this March to visit some of the best pipe shops and clubs in Arkansas, Oklahoma, Texas, and Mississippi. Pete will have a variety of BriarWorks products for sale and looks forward to hanging out with old and new friends, alike. Visit www.briarworksusa.com/tour for more details. The Southern Fried Pipe Club is hosting BriarWorks and our pipe makers' handmade lines at their January meeting. The meeting will be at Smokey Cigar 2 in Brentwood, TN, which has great atmosphere and a great selection of cigars and craft beer. BriarWorks will be at the West Coast Pipe Show this year. The show is November 5-6 at the Palace Station Hotel & Casino in Las Vegas, NV. There will be a variety of BriarWorks pipes available, with all of our current product lines represented. We will also have some excellent handmade pipes made by some of our skilled pipe makers. BriarWorks currently includes five team members that make their own fully handmade pipes and some of that work will be on display and available at the show. Stop by for a visit if you are attending the show. We look forward to seeing you! Welcome to the new BriarWorks website. There is a new look, new information, and a new web store intended to provide an easy to use, informative, and attractive experience for our customers. We hope you enjoy the new site.